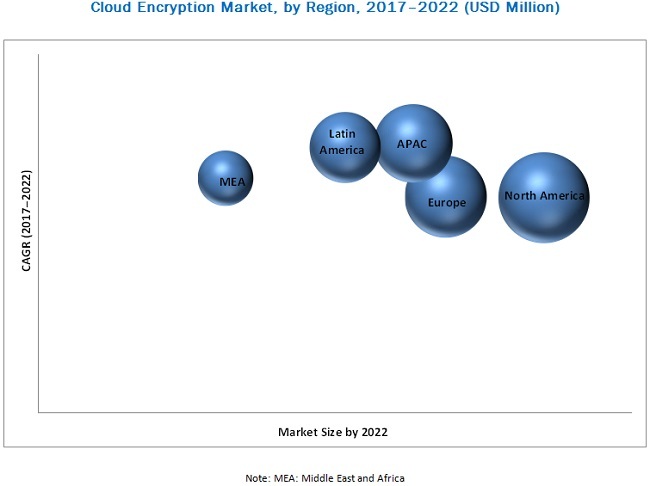 [168 Pages Report] The cloud encryption market size is expected to grow from USD 645.4 million in 2017 to USD 2,401.9 million by 2022, at a CAGR of 30.1% during the forecast period. Cloud encryption solutions secure data at rest and in motion through various standards and protocols. The proliferation in cloud adoption and virtualization, cloud environments risks due to big data analytics, and regulations have led to growth of the cloud encryption market. The growth of the cloud encryption market is also propelled by the need to combat with advanced threats and vulnerabilities, and secure the enterprise cloud. The base year for the study is 2016 and the forecast period is considered to be 2017 to 2022. Enterprises that store corporate data in on-premises workstations and servers rely on network security and endpoint security solutions for data protection. The management of large data volumes is likely to incur significant costs. Enterprises can increase their availability, scalability, and operational efficiency by moving to the cloud or adopting virtualization. Adherence to compliance regulations, reduction in business complexities, increased efficiency, and enhanced employee productivity are guaranteed by cloud deployments. The service models offered by Cloud Service Providers (CSPs) include Infrastructure-as-a-Service (IaaS), Platform-as-a-Service (PaaS), and Software-as-a-Service (SaaS). SaaS is more widely used as compared to IaaS and PaaS. By adopting virtualization, enterprises can gain access to virtual servers, virtual storage, and virtual networks. The proliferation of cloud services and virtualization, and increased instances of cyber-attacks have increased the need for encrypting cloud solutions. The cloud encryption market comprises key vendors, such as Thales e-Security (La Defense, France), Gemalto N.V. (Amsterdam, Netherlands), Sophos Group plc (Abingdon, UK), Symantec Corporation (California, US), Skyhigh Networks (California, US), Netskope Inc. (California, US), CipherCloud (California, US), Randtronics (New South Wales, Australia), Stormshield (Paris, France), HyTrust, Inc. (California, US), StratoKey (Texas, US), Secomba GmbH (Augsburg, Germany), Dell (Texas, US), Hewlett Packard Enterprise Development LP (California, US), IBM Corporation (New York, US), Trend Micro Incorporated (Tokyo, Japan), Cisco Systems, Inc. (California, US), Protegrity USA, Inc. (Connecticut, US), Vaultive, Inc. (Massachusetts, US), DataLocker Inc. (Kansas, US), Parablu Inc. (California, US), Hitachi Solutions, Ltd. (Tokyo, Japan), PerfectCloud Corp. (Ontario, Canada), Tresorit (Budapest, Hungary), Bitglass, Inc. (California, US), Spamina (Madrid, Spain), and TWD Industries AG (Unteriberg, Switzerland). These vendors sell cloud encryption market to end-users to cater to their unique business requirements and security needs. In March 2017, Thales e-Security entered into an agreement with BT, under which BT would be delivering Vormetric Transparent Encryption solution to its customers across the globe. Vormetric Transparent Encryption solution helps customers in safeguarding their data with data at rest encryption. In July 2017, HyTrust acquired Data Gravity, a data security company, to automate and quicken its policy enforcement for workload data. With this acquisition, HyTrust strengthens its position in the cloud security domain. In February 2017, CipherCloud partnered with BlackBerry to deliver end-to-end cloud security to customers who are relying on the BYOD trend in an organization. With this partnership, authorized users can access the critical information stored in the cloud environment. “Study answers several questions for the stakeholders, primarily which market segments to focus in the next 2–5 years for prioritizing the efforts and investments”. What are new application areas which the cloud encryption companies are exploring? The cloud encryption market size is expected to grow from USD 645.4 million in 2017 to USD 2,401.9 million by 2022, at a CAGR of 30.1% during the forecast period. 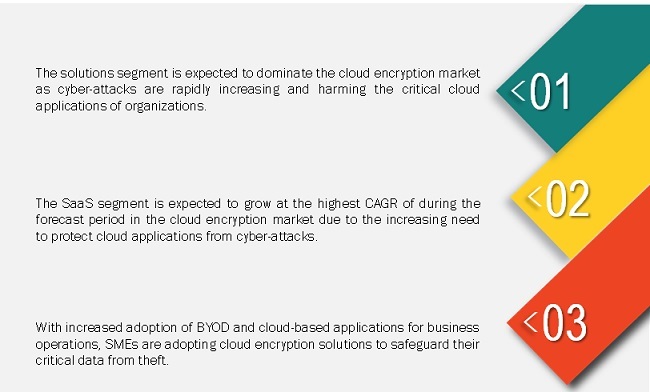 The major growth drivers of the cloud encryption market include proliferation in cloud adoption and virtualization, risks related to cloud environments, due to big data analytics, and regulations to increase the adoption of cloud encryption solutions. The cloud encryption market by component has been segmented, on the basis of solution and services. The market for services segment is expected to grow at the highest CAGR between 2017 and 2022. The high adoption of cloud encryption solutions and services by the global organizations contribute to the rapid growth of the market. The telecom and IT vertical is the fastest-growing vertical in the cloud encryption market. The usage of cloud encryption technology supports in improving the proficiency of clinical and IT staff, and providing real-time access in case of emergency. The retail vertical is expected to grow at a significant rate during the forecast period owing to their adherence to various compliance mandates through regulatory standards such as PCI DSS and TR-39. The government vertical consists of four institutional units, namely, central government, state government, local government, and social security funds. Public utilities are those businesses which fulfill the everyday needs of human beings. The government and public utilities lack trust when it comes to movement of sensitive data of its citizens from on-premises to the cloud environment due to privacy concerns. However, over the passage of time, these agencies are dependent on the file transfer capabilities as various documents are now available for downloading. But these file transfer sites are open and unsecured that may cause data leakage. The cloud encryption services enable these agencies to encrypt and control the data every time, collaborate securely with other agencies, state, and foreign partners, and limit the users to download, print, and edit the programming files and folders. Cloud encryption vendors offer various services to this vertical to protect the valuable cloud applications. The telecommunication sector is a key target for hackers due to vast and increasing amount of personal data being managed on cell phones, satellites, and the internet. Information Technology (IT) deals with the use of the computers and networking devices to produce, process, preserve, and protect various forms of the electronic data. Together, telecom and IT is considered a subset of Information and Communications Technology (ICT). In today’s rapidly changing technology landscape, telecom and IT is a constantly developing industry and is the epicenter for innovation and growth. The transformation has brought security issues and regulatory compliances that are affecting the working of companies in this sector. This vertical involves high usage of cloud-based applications for their business operations and is thus frequently attacked by cybercriminals. Companies in this sector are adopting cloud encryption solutions to provide their customers risk-free services. The usage of cloud encryption has allowed users to save their important information on their mobile devices and use that information through cloud without any risk. The healthcare sector covers personal health information and critical data about patient that needs high security, therefore, data security has been of utmost importance for this industry. With the proliferation of cloud technology, healthcare providers are starting to take advantage of it to keep their data secure. Cloud adoption has significantly increased and is expected to accelerate among healthcare organizations, driving agility and flexibility. Moreover, the healthcare industry is very conscientious about data privacy and some of these issues can be addressed through cloud encryption and cloud key management. Some of the major hacking cases in the healthcare industry have led to increased security against threats in this sector; for example, the recent attack on AHMC Healthcare office near Los Angeles, which leaked 7 hundred thousand patient records. Financial data has always been the primary target of criminals, but these days medical data is also becoming one of the lucrative targets. Furthermore, the usage of cloud encryption technology supports in improving the proficiency of clinical and IT staff, and providing real-time access in case of emergency. What are the applications areas of cloud encryption? The key players in cloud encryption market include Thales e-Security (La Defense, France), Gemalto N.V. (Amsterdam, Netherlands), Sophos Group plc (Abingdon, UK), Symantec Corporation (California, US), Skyhigh Networks (California, US), Netskope Inc. (California, US), CipherCloud (California, US), Randtronics (New South Wales, Australia), Stormshield (Paris, France), HyTrust, Inc. (California, US), StratoKey (Texas, US), Secomba GmbH (Augsburg, Germany), Dell (Texas, US), Hewlett Packard Enterprise Development LP (California, US), IBM Corporation (New York, US), Trend Micro Incorporated (Tokyo, Japan), Cisco Systems, Inc. (California, US), Protegrity USA, Inc. (Connecticut, US), Vaultive, Inc. (Massachusetts, US), DataLocker Inc. (Kansas, US), Parablu Inc. (California, US), Hitachi Solutions, Ltd. (Tokyo, Japan), PerfectCloud Corp. (Ontario, Canada), Tresorit (Budapest, Hungary), Bitglass, Inc. (California, US), Spamina (Madrid, Spain), and TWD Industries AG (Unteriberg, Switzerland).